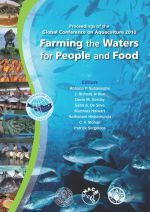 For three years NACA worked with a consortium of partners on a project to strengthen the adaptive capacities of small-scale farmers to climate change. The aim of the “Aquaclimate” project, funded by the Norwegian Agency for Development Cooperation (NORAD), was to identify the likely medium-term impacts of climate change on important aquaculture systems and to develop adaptation strategies that will help farmers to cope with the changes. The project has focused on five case studies that are important from a livelihood and/or food security perspective: Catfish farming in the Mekong Delta of Vietnam; milkfish farming in the Philippines; low intensity shrimp farming in India; improved extensive shrimp farming in Vietnam; and culture based fisheries in seasonal reservoirs in Sri Lanka. The project has mapped farmer perceptions of climate change through an extensive series of stakeholder consultations and developed climate change scenarios for the case study areas through local downscaling of mainstream climate change models. The final Partners Meeting was held from 14-16 May 2012, to present the findings of the project in preparation for a Regional Workshop on the Impacts of Climate Change on Fisheries and Aquaculture. NACA publishes audio and video recordings of presentations from technical workshops and conferences. You may listen or view the presentations via the player within the website, or download them for later use. Our audio files are in mp3 format, while video files are in mp4. Patrick White presents on Akvaplan-Niva's approach to climate change research. Nagothu Udaya Sekhar presents on BioForsk's approach to climate change studies. Varunthat Dulyapurk presents economic perspectives of climate change on aquaculture production. K. Muralidhar presents on climate change vulnerability and adaptation for shrimp farms in India. M.M.M. Najim presents on the impacts of climate on culture-based fisheries in seasonal reservoirs of Sri Lanka. Erwin Pador presents on climate change vulnerability and adaptation in milkfish farming, the Philippines. Truong Hoang Minh presents on climate change vulnerability and adaptation in Vietnamese catfish. Presentation on climate change vulnerability and adaptation in improved extensive shrimp farming systems in Vietnam.